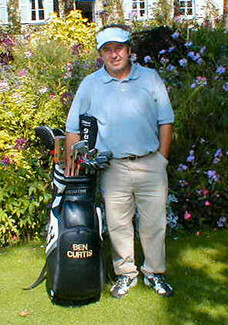 Ben Curtis and caddy Andy Sutton British Open 2003. European Golf Tour caddy Andy Sutton and British Open champion Ben Curtis were reunited the week of the 2003 Lancome Trophy European Tour golf tournament in Versailles, France for the first time since their British Open victory at Royal St. George's in early July 2003! They made the cut to the weekend at one under par. Andy has been caddying for his regular player John Bickerton on the European Tour since the Open victory with Curtis. Andy is again on the sack for Curtis in 2005! Here's our story about the great victory in the 2003 British Open at Royal St. Georges on the east coast of the English British Isles! European tour caddy Andy Sutton was driving back from just having missed the cut at the Scottish Open near Glasgow where he had caddied for his regular player John Bickerton, and was pondering what his next move would be. He was headed towards his hometown of Maidstone, U.K., just up the road from where the 2003 British Open was to be played the next week in Sandwich, at Royal St. George's golf club. Andy was making a comeback of sorts after spending the previous year unable to work and in rehabilitation from a severely fractured leg incurred while competing in an endurance motorcycle race. In his caddy career he had been Andrew Coltart's caddy and worked for Joakim Haeggman, when they won the Scandinavian Masters and also caddied for him in the 1993 Ryder Cup. Sutton called IMG (International Management Group) via his mobile phone and inquired about whether they had any player's who'd need a caddy at the Open. Ten minutes later IMG called him back telling him they had one Ben Curtis who'd qualified by finishing top 12 at the Western Open in Chicago and would be needing a caddy. Sutton had never even heard the name before but was elated to get a bag almost in his back yard and in the Open. Caddies never know what lies just ahead and down the road in the business of tour caddying. It is the lure of the possibilities of 'what might happen' though which drives them on. They always have to try to stay focused like their player and no matter how it's going on the course, move on to that next shot and try to execute it as best as possible. Andy was now headed to the next course to get to play his next shot and caddy in the British Open championship near his home town. With Curtis and Sutton's victory now history it just goes to show you the unpredictability of what can happen for both player and caddy alike. Caddies are aligned with the results of how well or poorly their player's do. And a fresh caddy on the bag on a links golf course which was familiar to Sutton but not Ben Curtis put Andy in a position to offer a lot of good advice. Curtis came into the tournament playing well and eager, Sutton was glad to be home sleeping in his own bed, and caddying again. Give Ben Curtis a lot of credit for listening to Andy too. Caddies don't hit a single shot out there but are often 'in on the play' that the player has to make. For instance Sutton suggested that Curtis use his 8 iron in pitch and runs around the greens early in the week and practice and Curtis took his advice instead of using the 9 iron (his first inclination). But more importantly, Sutton new what to expect with regard to the bad bounces, wrong misses, and wind that would all contribute to the golf ball 'getting away' from the player out there and how to deal with all of that. And Curtis, had a veteran caddy who'd won before and would know how to keep him loose down the stretch should they be in 'the hunt' at the right time. I happened to be near the 10th green on Sunday when Curtis was 4 under for the tournament and five for the day and was about to hole another to get to minus five and a three shot lead (all the big names were playing about a half hour behind him.) While waiting for their playing partner to play and Curtis to putt, Andy was quietly clowning with the camera man as if to block his view from getting a good shot. Here they were on a run and early lead going into the back nine on Sunday in the British Open and a caddy as loose as a goose! Curtis of course then holed his birdie three on # 10 and even though it was somewhat a struggle after that they managed to hold on during the hard holes coming in to post one under and win the tournament. Ben was just playing good golf and executing and having a good time at it too with his new friend and current compatriot Sutton. Sutton was just happy to have a job and having made the cut be in position for a good finish in the greatest of golf tournaments. Results weren't their focus as much as was the process of what each was doing out there. This all helped get Ben in the mode of playing one shot at a time instead of all that was happening to and around him. So there you have it. Caddy picks up player who's never played links golf before and is an immediate help. Player is talented young and hungry. Caddy knows all the necessary golf psychology to deal with the moment when it arrives. Voila! ; Curtis wins the biggest tournament title in golf and Andy Sutton goes from the 'Caddy Outhouse' to the 'Caddy Penthouse' all in one week's time. Ultimately it came down to Andy's ability to 'make the right play at the right time' -that timely phone call to IMG! All the rest is now history. Click Here for a Virtual Tour of Royal St. George's final six holes!